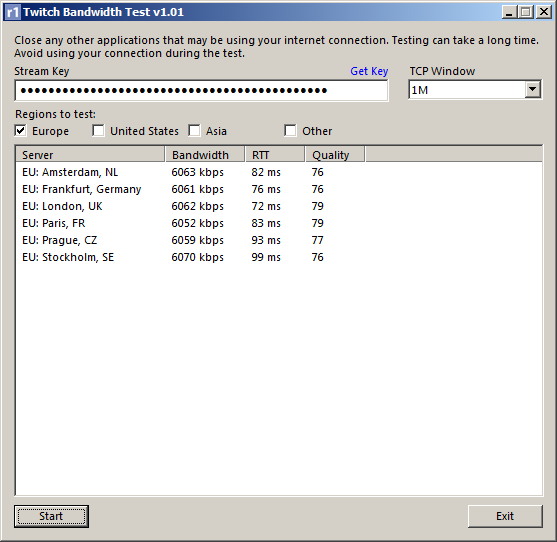 TwitchTest has moved! 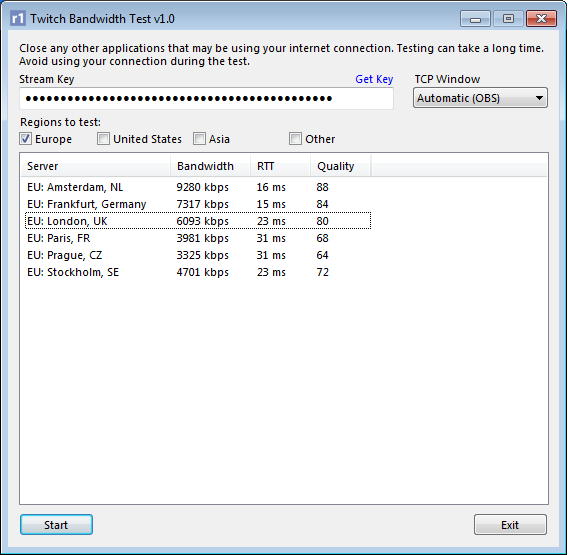 Check out https://r1ch.net/projects/twitchtest for the latest version. 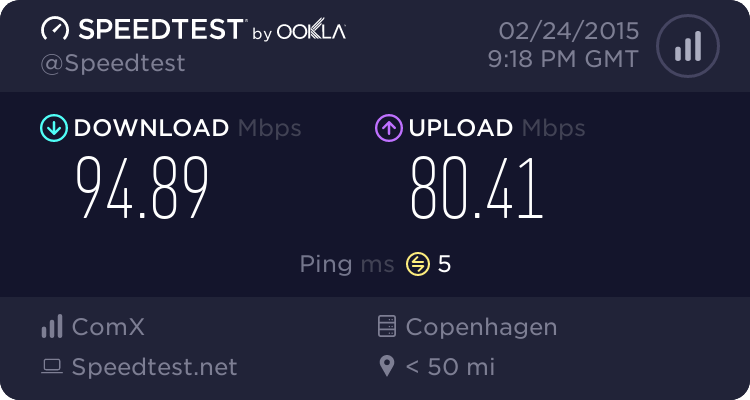 So weird that I get a better connection to Amsterdam than Stockholm Sweden from here in Copenhagen. 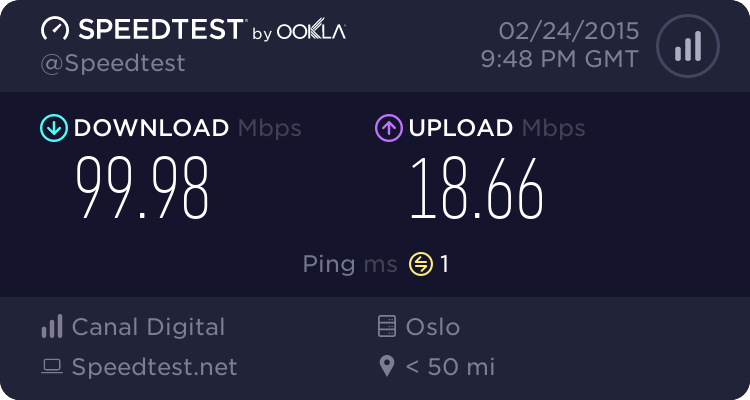 The Sweden ingest seems to have problems, I'm getting pretty bad throughput to it right now as well. After seeing your tweet about this I was eagerly awaiting it. Is it intentional that you cannot paste the key in to the box? Not a very user-friendly key to input in a masked box. It's just a regular text box so you should be able to paste into it. Very strange. Does not work on my end. Win7 Ult x64. Are you sure the stream won't go live? Fixed, looks like it's a problem if you copied a space with your stream key. Hi, thanks for making this program. I ran it, but got lower results than I was expecting. With this internett, I'd expect better. What do you think the issue is? Seems like your ISP has poor connectivity outside your country. Very cool, hopefully twitch makes this a feature or xsplit/obs add it :D Keep up the good work! With a higher TCP window (i tried 1M, but checked for a second on 256k and it seemed fine) i get very solid and consistent ~6050kbit to all EU servers. With the OBS default, it's much lower - around 3000-3400. I sometimes have problems streaming at 3000-3500kbit using OBS. Is that something that's expected, or a problem? Fixable or not? I clicked through all of the TCP windows testing the first server, 32k+ work the same (with steadily decreasing latency as it gets lower) but there's a huge drop off in bandwidth going below 32k. If this is a simple fix, it would be awesome. With 32k TCP window, i have pretty much all of my bandwidth and it's -extremely- stable (like 6040 - 6070 with no variance outside of that for the whole testing period) whereas right now i'm sometimes dancing around between 3500 and 2500 trying not to drop frames. It seems like OBS Automatic mode isn't getting the signals to raise the window like it usually does. You can specify a 1M TCP Window manually in the OBS profile.ini under Publish, TCPBufferSize=1048576. OBS will always try to use at least 64k though. Minimize network impact may also affect the results. It's set in bytes, eg 32k = 32768 bytes. You should check your OBS log though, it may be failing to raise the window to 64k for some reason as that should be the default. The automatic TCP setting seems to be broken. 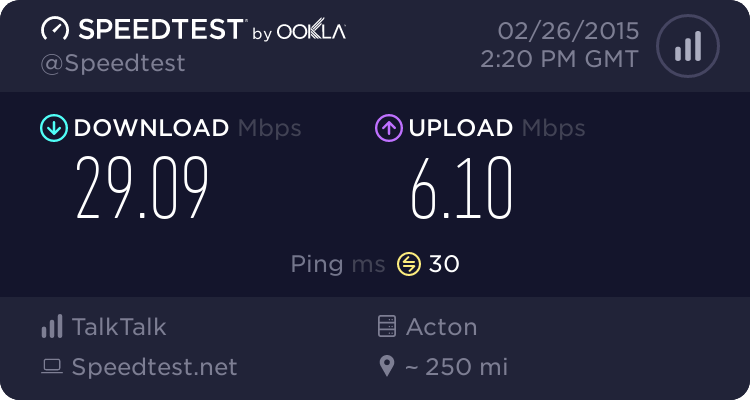 My upload speed is exactly 12.5mbps (very stable too). When I set the TCP to automatic my scores are all over the place, however they increase hugely when I manually set it. And my second score, at 32k is slightly higher (I'm edging my true upload score now in London (makes sense, I'm from Ireland). And my 128k score, I'm consistently hitting my true upload score (most likely anyways, it doesn't actually record the exact score after 10k). And now my 256k score, same again. Any clue as to what might be going on with the automatic setting? It gives me by far the worst results. Imgur links aren't loading properly on this page, I don't know why, but you can right click them and they'll open fine in a new tab. Automatic asks Windows to suggest a TCP window, it's possible due to the short test duration Windows doesn't have enough data to recommend one. I did notice a bug where automatic mode starts at system default instead of 64k (like OBS) which may affect the results.